Complete cooling packages matched to the powertrain including radiator, transmission and hydraulic oil cooler and fan can be supplied. Hydraulic cylinders for axles plus engine or transmission driven pumps can be supplied with all supporting ancillaries to complete the drivetrain. 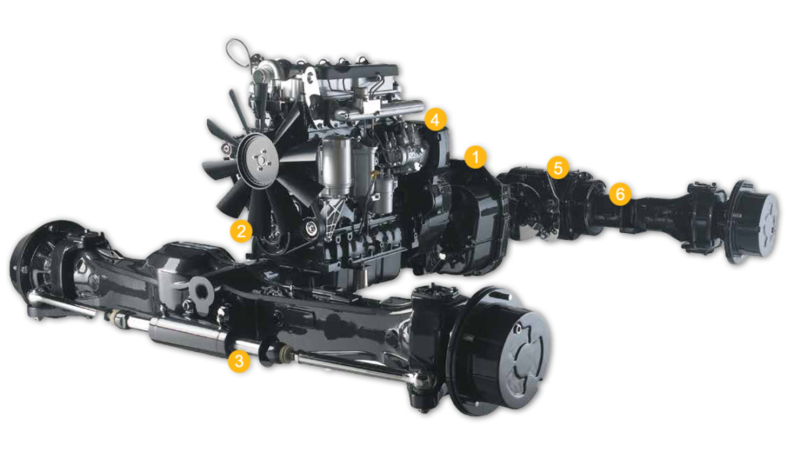 JCB 4 & 6 cylinder NA, Turbo, and Turbo aftercooled engines can be offered, with suitable torque converter and transmission to suit the OEMs own driveline system, mechanical Injection or electronic common rail injection systems can be supplied. Range of steer drive, rigid drive and dead steer axles with pad, pin or trunnion mounting and either cardan shaft or hydrostatic motor input. Options include: various axle ratios, differential types, service and park brakes. ‘Wet’ multi-disk brakes available on most axles to suit a master cylinder or hydraulic brakes.